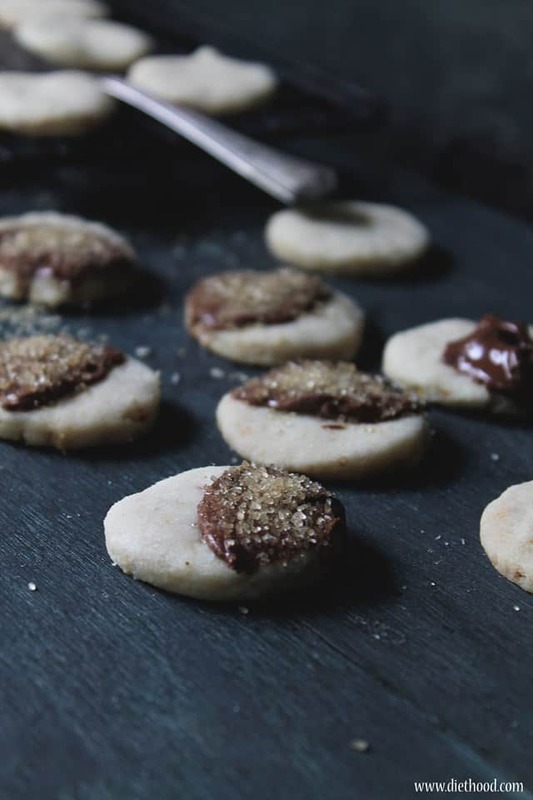 Hazelnut Shortbread Cookies – Shortbread cookies made with hazelnuts and vanilla sugar, topped with Nutella and glitter. Did I just take the kids to McDonald’s Playplace? Did I really do that?! The one thing I swore I would never do?!?! All I wanted was a few moments (2 hours) to stare at nothing and drink a cup of coffee. or Three. The thingamajiggers is that when I try to keep up with everything, I end up falling over. Well, not really falling over. Just feeling overwhelmed… Looking ahead, but can’t see through the piles of to-do… You know what I’m sayin’. 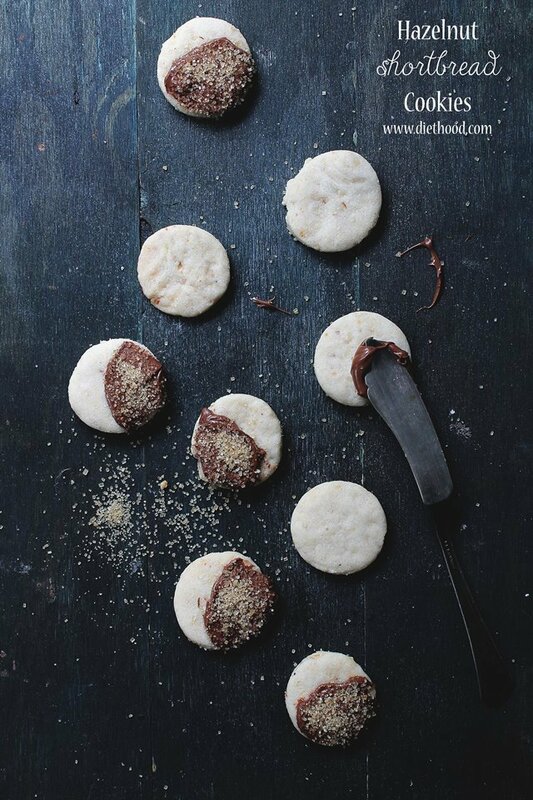 I know that if I had a few of these Hazelnut Shortbread Cookies, I would totally be back on track. It would take .03567 seconds for me to go from blah to wooooot! But, I ate them all last week. No, not all of ’em. My husband helped. And the kids. See, when you make shortbread cookies with hazelnuts, topped with Nutella and glitter, people wanna eat ’em. Fast. I have been trying to make these cookies “work” for quite some time. In the end, my gut feeling was right – vegetable shortening. Because, you know, shortbread cookies aren’t soft and buttery enough already. To add, I figured out that these cookies get better with age! They taste that much better the next day. The cookies literally take 10 minutes of hands-on prepping. The remaining of the time they will either be baking or resting. They are SO easy to make, they are delicious and stunning. You will not regret it. Save thy recipe! 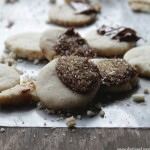 Shortbread cookies made with hazelnuts and vanilla sugar, topped with Nutella and glitter. In a large mixing bowl sift together flour and corn starch. Stir in hazelnuts, vanilla sugar, and powdered sugar. If you don't have vanilla sugar or can't find it, leave it out. Using a pastry blender or your fingertips, work in the vegetable shortening; work it in until it all disappears and it's well blended. Cover dough with plastic wrap and put in the fridge for 15 to 30 minutes. Line two baking sheets with silpat mat or parchment paper; set aside. Remove dough from fridge and let rest for 5 minutes. Flour your work surface and rolling pin; roll out the dough to a 1/4-inch thickness. Cut out cookies with a round cutter and transfer to prepared pan. You don't have to space them a lot - the cookies will not spread. Let cool on pan for 5 minutes; remove and cool on wire racks. 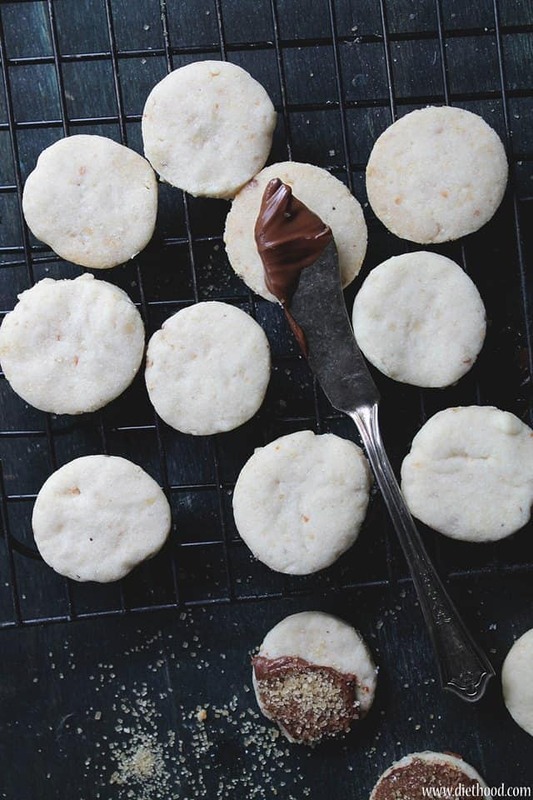 When completely cooled, dip them in Nutella and top with edible glitter or raw sugar. Cookies are best a day later. You can freeze the cookies for up to 3 months. YUM. these look amazing & love your beautiful photography… thanks for sharing the great post and recipe! Ha ha, love how you smuggled the nuts. I’m making the same thing for a friend today, I used butter, but love mixing it up with cookies. Hope you’ve gotten a little bit of a break by now. WOW! These cookies look AMAZING! You say you are now a professional, but you sure look like one, WOW! Delish! Hazelnuts are up there in the nut ladder for me, and I understand bringing them all the way from Macedonia. I`ve brought so many jars and pans in my bags, I think customs finds it terribly odd and takes my explanation. The nutella and glitter are the perfect final touch! Shortening makes some totally awesome cookies! Hazelnuts are a great addition too. Oh and we all feel overwhelmed sometimes. It’s such a bummer but we have to hope things will get better. My Scottish Grandma’s shortbread recipe is also better with age (though we use all butter, and a tiny scallop-edged round cookie cutter, and it’s not Grandma’s Shortbread if it’s in any other shape!) My mom would bake the cookies Thanksgiving weekend and store them in empty coffee cans, in layers of plastic wrap, in the top of the coat closet. She’d add them to the cookie tray we’d eat after coming home from church on Christmas eve and they were perfect. Thank you so much for bringing that memory to mind, Kate! As for the endless to-do list, the months of “putting ____ off” are over, but I forgot how the solo parenting gig saps my energy. I’m slowly getting into the rhythm of things now. Having a crisper full of fresh veggies from our CSA farm share helps, because I’m eating better even if I’m not sleeping. Have a lovely weekend! I did get the kids 4 packets of those apples at McD’s, (trying to choose something healthier) and they ate all of them! I love shortbread and I’ve made it with various different nuts. Hazelnut is the ultimate favourite in our household. I mostly sift powered sugar on mine however your Nutella with glitter certainly looks delish. Mmmm…….I think it’s time to make a batch! These cookies look like a cure-all! I don’t think mine would make it to a second day. Can’t go wrong with nutella and sparkly cookies! Yum! Do you prefer veg shortening to butter for any particular reason? Yes! I like shortening because there are some cookies that spread if you use butter. I didn’t want these to spread at all. Most of the time if I have it I will use butter flavored shortening. I don’t bake cookies often enough that I’ve ever considered the spreading issues. I DID have some concerns with some sugar cookies I made for the first time for my nephew. He was an adult but only my mom had ever made these cookies for him when he was a little boy, for Christmas with sprinkles on top, so he was nostalgic for them. Of course she had never had, nor did write down, a recipe, so I was going on pure guessing … but I did want the shapes to stay intact. The recipe I used only uses butter and as long as I cut the refrigerated dough to the right thickness and bake them at the right temperature, they don’t spread. Here’s an early picture of the first time I made them for Christmas. More intricate cookie cutters for Easter using the same recipe and not overbaking them. The only time I used shortening in my cookies was for some ginger snap cookies and the balls I shaped them in DID melt and spread … a bit. But I wanted to. I wonder if it depends on the recipe not necessarily the butter or shortening. I made a batch of shortbreads sandwich cookies filled with dulce de leche this past week … all butter, which kept their shapes beautifully. You could be right…it could all be up to the recipe. I am a self-taught cook, baker – everything is by trial and error. And a few books have helped me along the way. 🙂 I’ve always read to use shortening and corn starch in cookies. A big yes to these cookies, I love everything about them! (big points for the glitter) xo!